Simple, delicious meals can be built around vegetables. Stir-fries are a good starting... and end point. Stir fry vegetables are a quick and easy way to add interest to a basic meal. Even easier is the one pot meal — one wok meal; put everything into your wok or frypan, stir, serve and eat. If nobody else is around, don't you dare eat straight from the pan...it's lazy and bad mannered...I know, but it's nice! 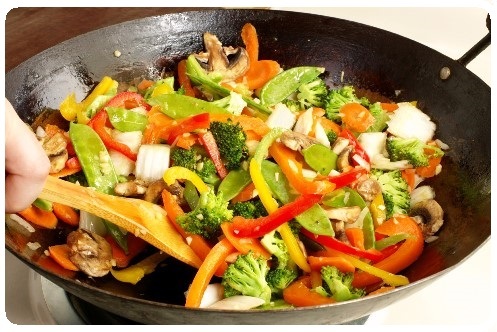 So that you get the most benefit from stir fry vegetables, here are the stirring steps to follow. . . . Preparation: This is the key. Stir frying is cooking food that's been cut into small bits, therefore it cooks quickly. So wash and cut your veggies and have them all ready to add to the pan when needed. Thus you produce perfect, slightly crisp food with no danger of overcooking. Heating Oil: High heat with oil is traditionally used with stir fried meals — but if you like you can successfully change the rules to make it healthier. Instead of oil, use stock or water; just the tiniest bit and keep stirring! Research shows that high heat cooking with oils or fat can add to a risk of type 2 diabetes, cardiovascular disease and bladder and pancreas cancer. Once your food is cooked, you can then add your favourite oil... olive oil, coconut oil or any of the other cold-pressed, healthy oils. Protein: If you are adding proteins such as tempeh, tofu, meat, fish etc, it's better to stir fry these first, then remove from the pan, cook the veggies and add the cooked proteins back in to heat just before serving. Sugar: Most Asian restaurants and cooks add sugar to their dishes. Usually only 1 teaspoon to a family sized stir-fry. If you really want a sweeter taste, try a healthier alternative of ½ teaspoon raw honey, stevia or xylitol. Raw: Raw food added at the end provides healthy enzymes and extra nutrition. I throw all sorts of things on top when serving, such as a handful of chopped herbs; chopped crushed garlic; grated carrot, cucumber, zucchini, daikon; shredded cabbage; snow peas... there are endless ways to surprise and enrich a stir-fry. Be Adventurous: Have I ever followed a stir fry recipe? Have I NOT. The versatility of stir fries is that you can use what you have and change ingredients and quantities at your whim. Having confessed to the above, it's a good idea to follow a proven recipe and then experiment when you want to later with your own ideas. Maybe leave out the whatever... chilli? Maybe add extra broccoli or throw in some beans if that's what is growing in your garden? Maybe add parmesan cheese over the whole caboodle when finished. Maybe... oh the choices are endless. - Heat the oil (or stock or water) in a large frying pan or wok. When medium hot, add the garlic and ginger. Stir for one minute. Add the carrots and stir for another minute. - Add the peppers and cauliflower and stir for another 3 minutes. Add the beansprouts and stir for another 1 minute. - Final flourish now... add the stock, orange juice, soy sauce and brown sugar if using. Cover and cook for 3-4 minutes. As soon as vegetables are JUST tender enough, transfer to a serving dish and serve immediately. You can make unlimited variations to this dish. Just make sure the longer cooking vegetables go in early.